1. Cape Cod National Seashore parking lot to the left of the end of Chequesset Neck Road in Wellfleet. 2. Duck Harbor parking lot in Wellfleet, one mile north of Trailhead 1 at the end of Griffin Island Road. Note: This guide has been rewritten as the composite of two short walks. Each half has its own topographical map. 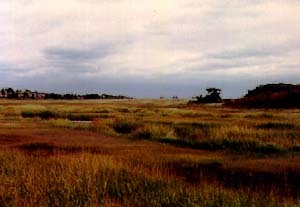 Park at the National Seashore lot for Great Island at the end of Chequesset Neck road (001). Follow the signs to Great Island from the east side of the parking lot. At the bottom of the hill, about 200 yards (002), walk left on the sandy track to Chequesset Neck Road (003). it bends to the west (005), running along the edge of Duck Harbor marsh. You passed (004) which leads to Bound Brook Island Road. That road can also be used to tie the two walks together, by proceeding north on Bound Brook Island Road for about a mile to where it turns left to the Atwood-Higgins property. In about 0.7 mile, you will come to the paved Duck Harbor Road (010) leading west to a parking lot for the beach. At the west end of the parking lot (006), a foot path goes south up to the top of the cliff (007). Stop for a spectacular view of Provincetown and Cape Cod Bay. Walk south on the foot path for 0.3 mile until you reach another leading east (008). Follow it for about 0.2 mile to Griffin Island Road (009). Walk south on the road to the start. You have circled Griffin Island, which is no longer a genuine island. The walk is a little less than four miles. visit the marker for the Brook Island School, about 100 yards south in the woods. Note: Also at (004), a dirt road proceeds north. A foot path leads north from that road out to a spectacular lookout, and then circles around to rejoin Bound Brook Island Road just west of (005). This route is described more fully in Truro Short Walks under Ryder Beach. Continue on the dirt road to (005); stop to visit the Atwood-Higgins homestead. Then walk down to the triangle at (006), where a remnant of the railroad bed goes off to the northwest. Follow that to a sand road (007), turning west to walk past the houses to a foot path at the end of Ryder Beach Road (008). Note the sign that welcomes pedestrians along the way! Note: The path south from the end of Ryder Beach Road is prone to flooding. We now recommend walking out to the beach at (008) and thence south to return to (002) and the parking lot. 4.6 miles. Walk south on the path past the houses to a sand road which heads south. At (009), where the road heads east, walk west on the foot path out to the beach (010). Walk south on the beach to return to (002) and the parking lot. 4.6 miles.